ARE YOU AFRAID THAT THE STROLLER FALLS EACH TIME YOUR CHILD JUMPS FROM IT? Did you have to pick up your coats, backpacks and the purchase from the floor because your stroller does not stand up when your child gets off? This is a very common problem: we leave the house and little by little we hang the most varied items of handholds. The backpacks, the little coats, a bag of bread, our own coat, all that and more is what we have hanging from the chair. Then, the moment your toddler gets out of the chair, everything falls to the ground! The strollers are designed with the center of gravity displaced backwards and they are also very light, something that makes them very unstable with little weight hanging on the handles. The worst of all is that, in addition to that, you can spoil the stroller or anything else that you are carrying away on it. Fortunately, for every problem, there is a solution: PONNY. What would you say if I show you a patented accessory for your stroller that is unique in Europe and that will avoid the falling of the stroller forever? What would you think if I tell you that you can carry everything you want hanging from the cart and that when your child jumps out of the chair, it will still stand and all your things will be safe? And if I tell you, besides, that you will not notice that you have it installed because it only weighs 300 grams? I show you PONNY, a very simple and effective accessory that will make you forget the problem of the overturning of chairs. It is an easel compatible with 98% of the strollers and that you can operate and pick up with your foot. Its installation is very simple and, once placed, you will not have to worry about it anymore because it does not interfere with folding. You can see in this video how easy it is to use PONNY. With PONNY, forget the rollovers and relax in the company of your children. Focus on what truly matters to you because NEVER AGAIN will you see the chair and everything you carry on it lying on the floor. But there is still more: PONNY is a very, very light accessory that will not hinder any manoeuvre of which you usually do. It weighs only 300 grams and you will not even notice that it is installed there. Only when you check that your chair does not overturn more will you see that it is essential. It is the perfect point of support. The installation of PONNY is very simple and we will guide you in detail thanks to a simple tutorial that we have available for you. You will only need an Allen key of number 5 and a Phillips screwdriver. PONNY can be installed in the vast majority of the market strollers, and we even have special screws for some of them, so that the attachment is optimal. If you have questions, you can check here if PONNY is compatible with your chair. You can have PONNY in your home in few days from when we process the order. Upon receiving the package you will discover a blister pack containing the PONNY easel and an instruction guide. In that guide, you will see that there is a QR code and the address of our website to see the demo videos. You will not see how your things scatter on the park floor, or in the queue of the supermarket, making you embarrassed and you have to recover all the belongings. It weighs very little: 300 grams. Forget about keeping weight in the lower bag that only manages to manoeuvre the cart. 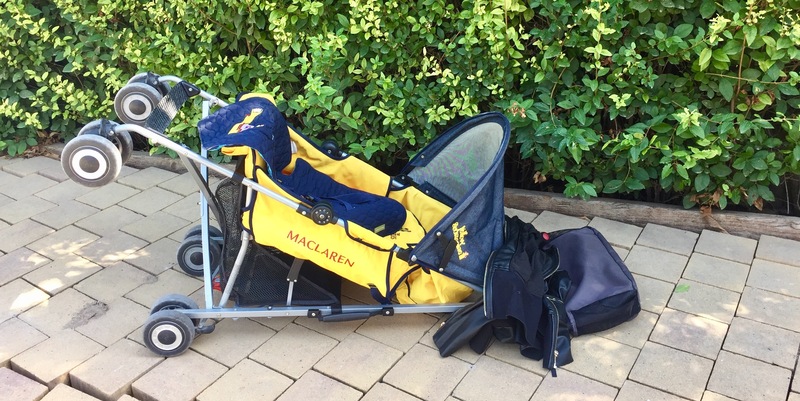 You will secure your stroller just by moving one foot, and it is even easier to pick up! You don’t need to remove it and put it on every time you take out your stroller. You install it once and it lasts you the whole life of the chair! You will have us for any doubt forever, and for any problem that arises with your PONNY, you can return it during the first 14 days without questions. "If I'm honest, I had heard about the issue above, and it seemed silly that it wouldn't work, I was wrong ... and I could verify that ... yes, it works"
AUTHOR OF THE BLOG "LA CASITA DE CELIA"
"I think it's great as a different and practical gift for all kinds of families, from those who are first-timers to those who have several siblings, because surely nobody has thought to give him a Ponny, with that typical thought of "Regarding he is the second sibling, surely the parents have everything ", because no, in my case, Pirata Baby didn't have it, it could be a great gift being she the third of my pirates." AUTHOR OF THE BLOG "UNA MADRE EN LA COCINA"
"We've tried it for a few days and it definitely makes life a lot more comfortable. If you follow the instructions that it brings, you can install it in 5 minutes (don't do like me, I went free and they had to help them) and it does not interfere in the folding of the car, you only need an allen key of No. 5 and a star screwdriver . " AUTHOR OF THE BLOG "MAMÁ EN LA SELVA"
"Ponnyshop had one of the most incredible things in the world. This is a technical draw, we liked Mom and me. Do you know how many times the car has been turned over because my mother decides that she can hang all the things on the handles? Well, they have designed a "kickstand" that fits 98% of the scissor trucks on the market and prevents these falls. How something so simple and basic can exist without us knowing it! And why don't all the mothers have one yet? " Authors of the blog "BEBE FRIKI"
"This is an invention that I will talk to you a little bit later on, but that seems like a spectacular idea to avoid that the second-class carts are loaded with weight. For me it's a simply fabulous idea. " "It's an easy thing ... and very effective." "It's such a simple idea: that's why it's great." AUTHOR OF THE BLOG "MAMIS Y BEBÉS" AND WRITER OF THE BOOK "RELAXING MUM (OF CAFÉ CON LECHE)"